The Imperial Building, from the southwest corner of Bank and Cooper. As someone who has generally studied Ottawa’s urban history through the lens of residential development more so than its commercial or industrial development, the construction of office space in the city appears to be related, but different. That is, there is no question that we’re all dominated by the ebbs and flows of federal government growth and activity, but office space seems to (in my own casual observation) to lag relative to residential construction. Having been here for 13 years (and seeking answers to my questions for as long), it always seems that the city either has a surplus or a deficit of office space, with the opposite impending in all projections. 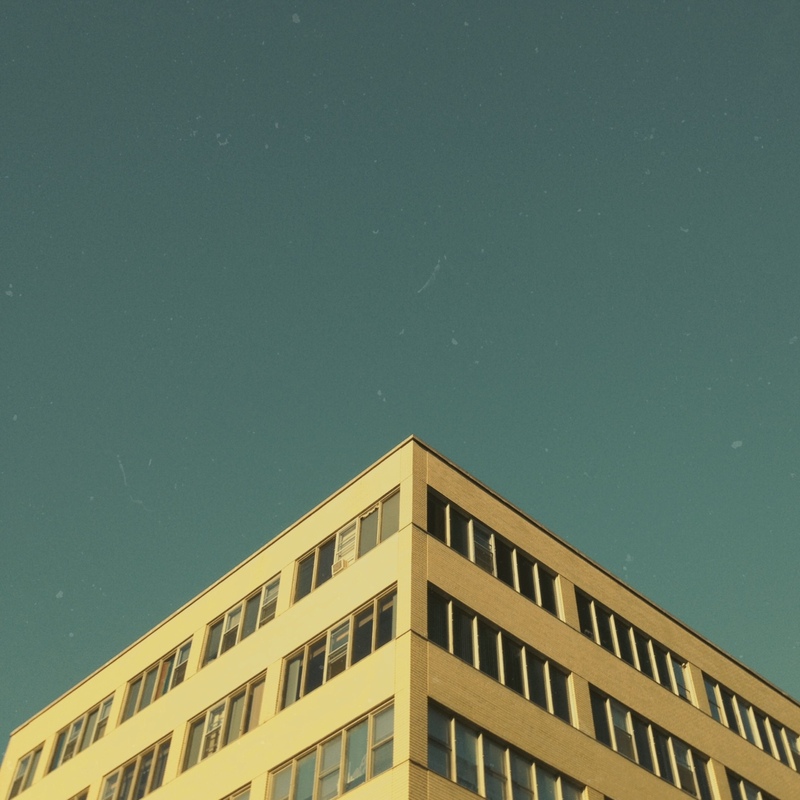 In any event, the Imperial Building was constructed in 1957 for Brouse Holdings (an organization which continues to operate today) in the midst of an acute shortage of office space. The building’s architect was J. Morris Wolfson (who, among other things designed the Tiffany Apartments in the Deep Cut and would go on to design McArthur Plaza) and the contractor was James More and Sons. It was to cost $325,000. Much like the Wesley Building at Holland and Wellington, the Imperial Building was also designed such that floors could be added at a later date as demand increased. The federal government, significantly larger than it was prior to the war, had snapped up much of what was available in the city and was hungry for more: much more. It didn’t help that Ottawa’s private sector had the same heightened demands. 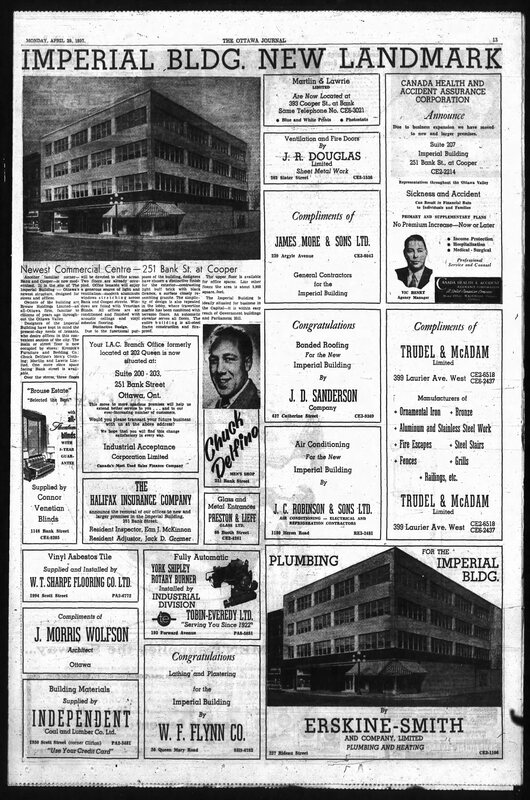 The new Imperial Building opened in the Spring of 1957 and was announced in the same way that new office blocks and apartments were at the time: with a full-page newspaper spread complete with picture and advertisements of the contractors who worked on it. Call Vic Henry at CE2-2214 for a quote. As can be seen from the above, the building was first completed at four stories and was later extended to the seven that it is today. Like many of the offices on Bank constructed during 50s and 60s, the tradition of ground floor, street-facing retail was continued. No inward-facing, maze-like mall space. Delfino is fast asleep on a 7th Heaven futon. 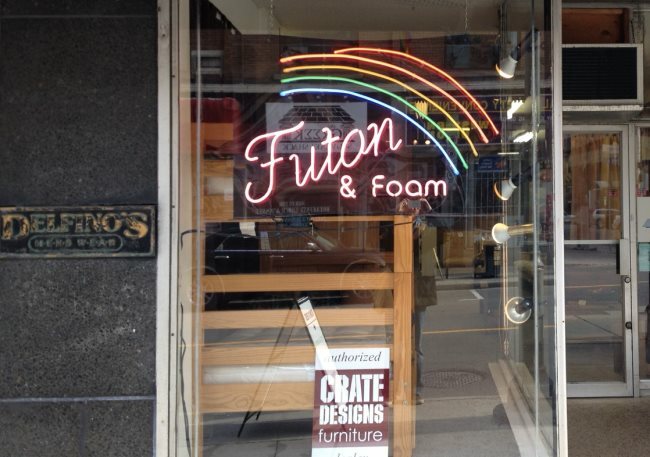 At opening, the two main retail tenants were Chuck Delfino Men’s Wear (whose plaques still grace the building’s exterior), and Sol Kronick Furniture (who had relocated from across the street into the modern new store). Among the longer-lasting office tenants of the upper floors were law firms, real estate firms, and perhaps most interestingly, an insurance firm that specialized in the coverage of hockey players and other athletes. Gord Lomer had his finger on the pulse of the city. Although I am uncertain as to the specific date that the Imperial was renovated to add the new floors (it does not seem to be in place on geoOttawa’s 1965 aerial map, but most certainly is apparent by the 1976 aerial photos), it does seem that they were added rather quickly. 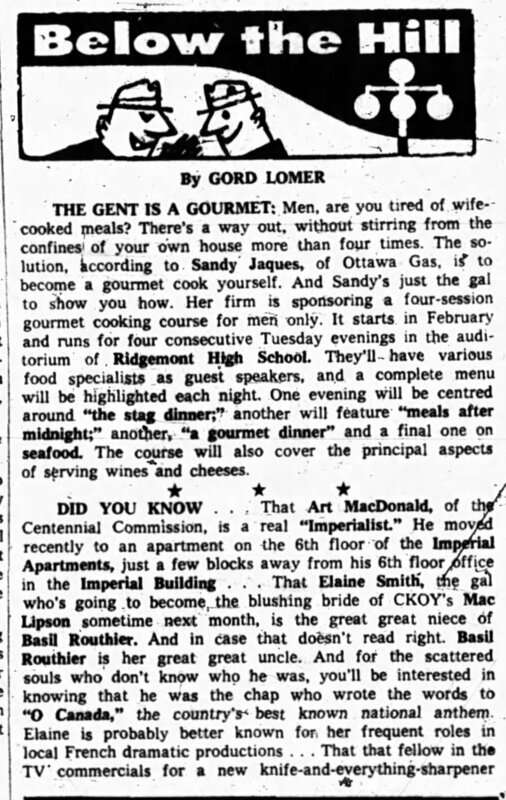 The Journal’s Gord Lomer reported at the end of 1964 that Art MacDonald, a member of the Centennial Commission had his office on the building’s sixth floor. 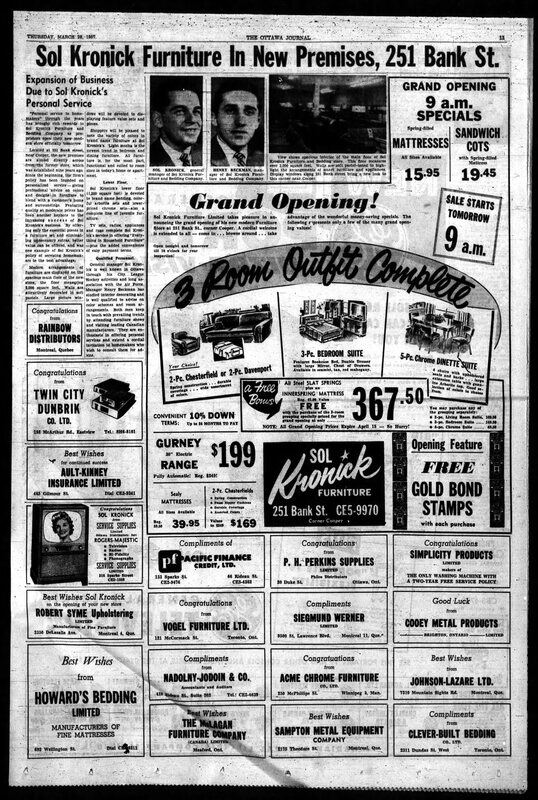 ** For the purposes of retaining focus in this short piece, I’ll mention here that Harry Brouse was an exceptionally interesting figure in the development of Ottawa during the early part of the 20th century. As the developer of numerous office blocks, the Imperial (Barrymore’s) and Family theatres, as well as the inventor of a gum vending machine (Peerless Vending Co.), the Brouse name both loomed – and continues to loom – large in the Ottawa area. I will be assembling a piece on him as well.